Video clip synopsis – This humorous program takes a close look at Australia’s Cane Toad pest problem. Broadband MP4 canetoads_bb.mp4 (16.4MB), suitable for iPods and computer downloads. 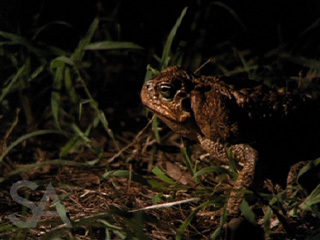 This video clip is an excerpt from the film Cane Toads – An Unnatural History, produced in 1987. This off beat and entertaining documentary presents not just the biological information but the surprising range of people’s attitudes to these grotesque creatures, including keeping them as pets. Students read and view texts that entertain, move, parody, investigate, analyse, argue and persuade. These texts may include documentaries that contain accessible but challenging issues that deal with local, national and international events. They explore personal, social, cultural and political issues of significance to the students’ own lives. Students write imaginative texts in print and electronic mediums that contain personal, social and cultural ideas and issues related to their own lives and communities and their views of the expanding world. These are extracts only. For further information, please see The National Curriculum Statements for English. The Bufo marinus Cane Toad was imported from Hawaii in 1935 to save Queensland’s sugar crop from destruction by the grey-back beetle. It failed because the beetle could fly and the cane toad could not. However, the Cane Toad stayed and became a pest of plague proportions and part of local culture and mythology. The introduced species of Cane Toads continue to be an environmental problem in Australia. They now occupy more than 500,000 square kilometers of Australia and have reached densities of 2,000 toads per hectare in some areas of the Northern Territory. In the film a wild life research officer, an animal ecologist, a shire councillor, an associate professor of biology, a wildlife ranger and local residents talk about the Cane Toad. Cane Toads – An Unnatural History was nominated for a BAFTA for Best Short Film, won an AFI award and, until recently held the Australian box office record for documentary. Mark Lewis, the filmmaker, uses many of the classic conventions of documentary filmmaking – interview, talking heads, dramatic re-creations, natural-history-style shots, stills and text – but executes them with such a unique twist that the outcome is far from conventional. The result is that his film is quirky and often funny. Write a script for a 2-minute radio interview with Mark Lewis about Cane Toads – An Unnatural History that reveals his filmmaking style and how he made a humorous documentary with a serious message. You need to discuss five different film techniques used by Lewis. add a 50-word update on the present situation of the Cane Toad by doing some research. current government policy about getting rid of the Cane Toads.